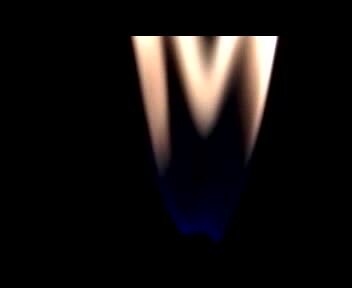 This movie shows evolution of the flame attached to the nozzle exit in the cases of teh transverse acoustic field effect. When the jet outflow velocity reaches a certain threshold value, the flame lifts off abruptly from the nozzle exit and the so-called lifted flame is implemented. In this case, the flame bifurcation under the acoustic action within frequencies from 1 to 3 kHz can be clearly observed.